A Karen Didion collectible, available exclusively at Wine Enthusiast! Tennis anyone? Our exclusive For the LOVE of Wine Santa collectible is simply smashing! His classic tennis outfit is accented in Christmas colors from his red headband to his red and white tennis sneakers. His tennis bag has room for his racquet as well as a favorite bottle (or two) for after the game. 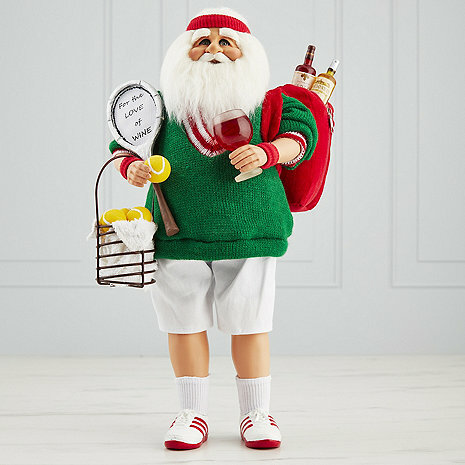 Meticulously handmade with hand-painted face, soft snowy beard, glass inset eyes and exquisitely detailed accessories. I love my wine Santa! As an avid tennis player, wine drinker and lover of Christmas, the combination of three of my favorite things was just something I could not resist!! Love him!! Would highly recommend this item. my wife loved as she was a tennis player. very good detail. This was the perfect surprise gift for my tennis director husband. The details are perfect, from the sack of wine bottles to the racquet to the bucket of balls. He loved it! Great Santa that allows us to celebrate Christmas and celebrate the sports we love, all at the same time. This â??guyâ?? stands next to our â?? golfer Santaâ?? . Besides celebrating sports it complements our love of wine. It is so well crafted and packaged. It will make the perfect gift for my tennis playing, wine drinking, lover-of-all-things-Christmas friend from her tennis teammates when we celebrate at our annual Christmas luncheon. Well done, The Wine Enthusiast! Just as per other reviews the wine glass was not secured in Santa’s hand but laying in the bottom of the box when we received it, so we glued it in before wrapping & giving it to my husband . Thank you to the other reviewers for mentioning this or we would not have known to look for this issue. When I received the Santa, the wine glass and the tennis ball was in the bottom of the box. I glued the wine glass back in place but the tennis ball doesn’t fit in his hand. The tennis racket is attached to his sweater and it looks strange hanging off the sweater. I’ll probably call and see what I can do to fix it.